Late last night, Motorola unveiled their newest mobile-related product, though this time it wasn’t created for you and I. No, with Motorola Buds – a Bluetooth headphone collar – Motorola is taking on a market that few tech companies have ever ventured into before. It’s time for animals to share the same luxuries that we have enjoyed for years, one of them being HD audio while on the go. Who would have thought that your dog needed a comfortable, ear-stress-free way to listen to the new Drake album while leash training? Or digging into the neighbors’ garden at 150 feet away from his phone? 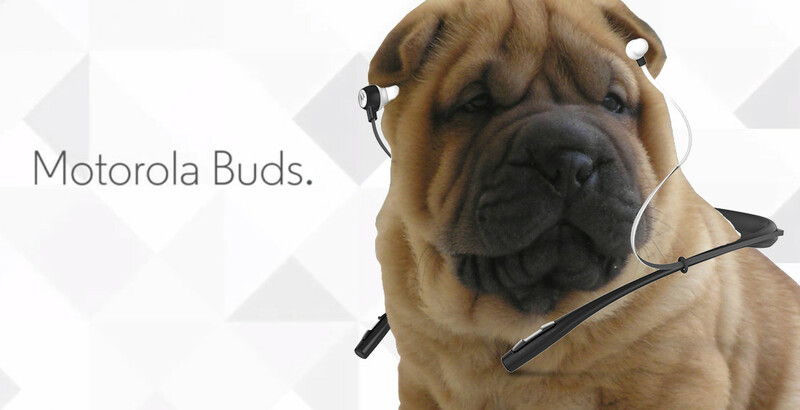 We also all know how easy ear buds are to lose or tangle, so the magnetic tips of Buds should make for less frustrations when Barkie pulls them out of the kennel each time. Wait…these weren’t made for dogs?